Compact Bluetooth Stereo Amplifier - Desktop Audio Power Amp Receiver with FM Radio, MP3/USB/SD Readers, Digital LCD Display, Microphone Input (200 Watt) Features: Desktop Audio Mini Power Amplifier Compact Home Theater Stereo Receiver Style Built-in Bluetooth for Wireless Music Streaming FM Radio with LCD Digital Display ID3 Tag Song Readout Displays Track Title Multi-Channel Audio Input Selection MP3 Audio File Support Connect & Stream Audio from External Devices USB Flash Drive & SD Memory Card Readers USB Doubles as Device Charge Port Aux (3.5mm) Input (2) 1/4'' Microphone Input Jacks (2) Pairs RCA (L/R) Audio Input Connectors (2) Pairs Banana Plug Speaker Output Connectors (1) Pair RCA (L/R) Audio Output Connectors Front Panel Audio Control Center Radio Station Auto Search Scan 'Repeat & Random' Audio File Functions Unique 'Track / Folder' Music Search Control Knob Treble, Bass, Master & Microphone Volume Adjustable Bluetooth Connectivity: Receives Wireless Signal for Audio Streaming Simple & Hassle-Free Pairing Setup Integrated Antenna for Extended Wireless Range Works with All of Today s Latest Devices (Smartphones, Tablets, Laptops, Computers, etc.) 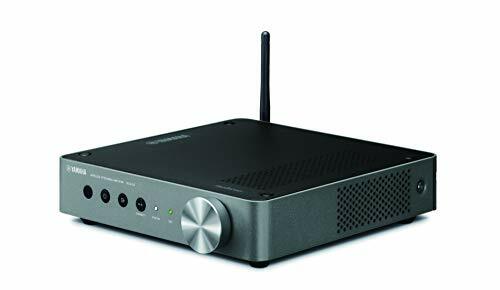 Bluetooth Version: 2.0 Bluetooth Network Name: 'PDA6BU' Wireless Range: 40'+ Ft. What's in the Box: Desktop Stereo Amplifier Remote Control FM Antenna Technical Specs: MAX Power Output: 200 Watt (@ 4 Ohm) RMS Power Output: 100 Watt x 2 (@ 8 Ohm) Tone Control: Bass, f=100Hz +/-8dB Frequency Response: 20Hz-20kHz Frequency Adjustment: +/-10dB Signal to Noise Ratio: >71dB T.H.D. 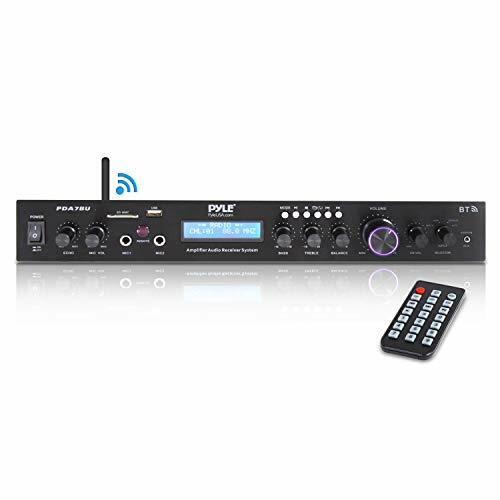 : Radio Station Presets: Up to 60 Stations Battery Operated Remote, Requires (1) x CR-2025 Button Cell Battery, Included Power Supply: 120/240V, Switchable Dimensions (L x W x H): 9.8'' x 9.8'' x 3.9'' -inches The Pyle Bluetooth Stereo Amplifier Receiver is the perfect solution for all of your audio needs! Add powerful home theater quality sound performance to your desktop with compact amplifier style. Deliver clear, accurate sound that's loaded with plenty of sound playback features including Bluetooth wireless audio streaming, FM Radio, USB flash and SD memory card readers, MP3 digital audio file support -- along with an Aux (3.5mm) input jack to directly connect & stream audio from external devices. Rear Panel connection interface includes dual 1/4 inch microphone jacks, RCA (L/R) connectors, banana plugs, and the USB input also doubles as a device charge port. Gain convenient audio control with the front panel button control center while the digital LCD screen provides ID3 tag readout that conveniently displays track titles. 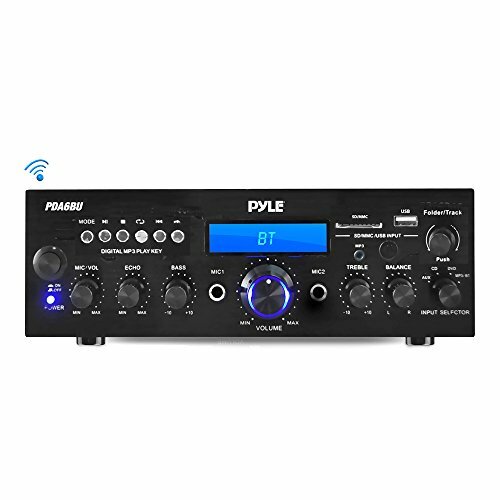 Enjoyed versatile high-powered sound performance with the Pyle Compact Home Theater Amplifier Stereo Receiver System. DISPLAY METER: The integrated receiver for home stereo has a built-in LCD display w/ front panel audio control center, ID3 tag song readout displays track title. FM antenna and remote control are included in the package for distant audio adjustments . 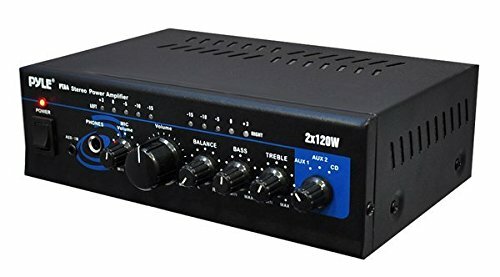 Mini Stereo Power Amplifier - 2 x 120 Watt with AUX, CD and Mic Inputs RCA REC Output 1/4'' MIC Input Jack 1/4'' Headphone Jack Power On LED Indicator 110/220 Voltage Selector 2 x 120 Watt Peak at 4-Ohm Blue LED Output Level Display 3.5mm Aux CD/MP3 Input Jack Switchable MIC Pager and Mixing Modes Four Push Type Speaker L/R Terminals Switchable AUX1/AUX2/CD and RCA Input Bass, Treble, Balance, Master and Mic Volume Controls Dimensions:8.27''W x 2.72''H x 5.39''D Pyle PTA4 Home Amplifier is perfect for powering any stereo system. Complete with AUX/CD inputs, and 2 x 120 watts of power -- this simple to use and durable amp has bass and treble controls, a slick blue LED output level display, L/R RCA inputs, and 4 speaker outputs. Using sophisticated circuitry and premium components for uncompromising musicality -- this product is famous for delivering powerful and accurate sound. 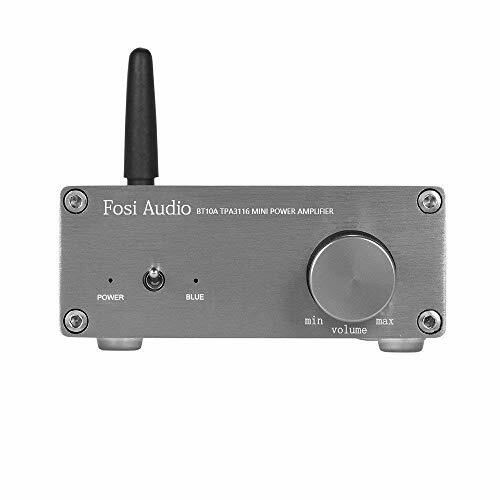 This small but powerful amp delivers clear and crisp audio for it listener. Durable and affordable, this amp is made to last. 1. Please plug the power cord into the amp THEN the wall. 3. You can pair with your Bluetooth device when the amp power on. But if Bluetooth connects, playback from the physical input is interrupted. 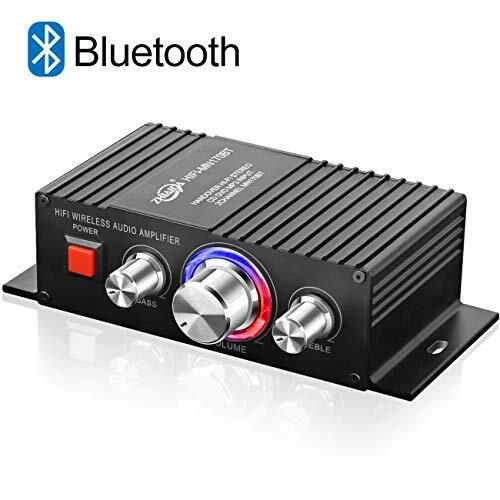 If you want to connect this amplifier with the audio cable(physical input), you need to interrupt the Bluetooth first. (turn off Bluetooth from your Bluetooth device). 12. Supplied Accessories: Amplifier, Power supply, AC power cord, Manual. Unplug the RCA cable, connect this amp to speakers, and then plug into the power supply, power on and volume on, hear whether noise exists on speakers, if noise existed, the noise may from speakers or amp, so you need to change speakers for further confirmation. If no noise the noise may from the audio source. With Bass and Treble Control version: B076P2VS9H . We had changed a new power supply, which can fit the amp well. If you received the old one, you can contact us for exchange at fosiaudio@hotmail.com. 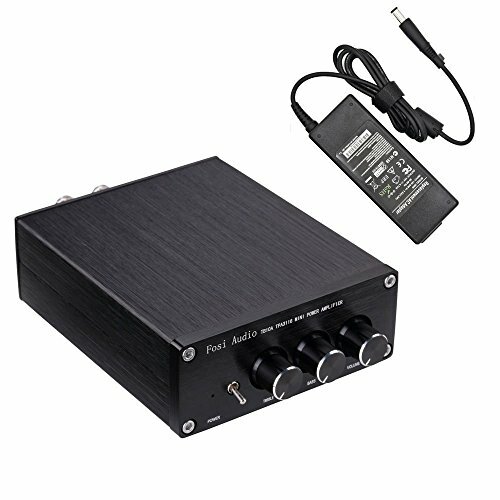 90 Watt Class-T Hi-Fi Stereo Amplifier with AC Adapter Included 12V AC/DC Adapter Class-T Circuit Design Microphone Input Jack Speaker Impedance: 2-8 3.5mm iPod/MP3 Input Jack Signal to Noise Ratio: >80dB Total Output Power: 90 Watt Input Power: DC 9 ~ 14.4V 2A Total harmonic distortion: Frequency response: 20Hz-20kHz Short Cut, Overload & Overheat Protection Dimensions: 6.02'' x 4.96'' x 1.5'' The PFA300 is a class-T digital amplifier with up to 90 watts of power. Use it in your car, your boat, your RV, your golf cart, your home anywhere you need a great amplifier with low distortion and acoustically accurate reproduction of music. Adjust the bass and treble to your liking, or bypass the included EQ. 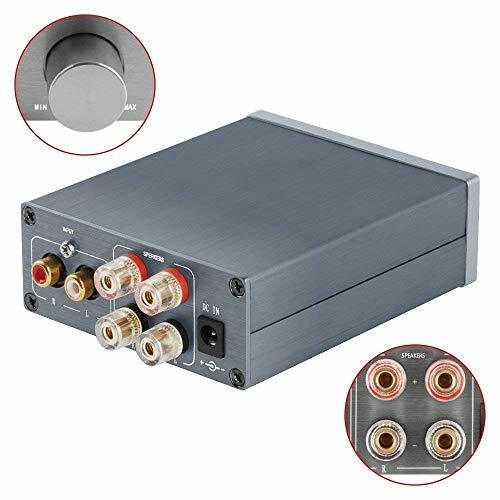 Takes 3.5mm stereo jack input or stereo RCA. 2-8 ohm speaker impedance compatible. Includes a 12 V DC adaptor. The ultra-portable BoomStick adds vivid definition to your audio devices and creates a truly immersive listening experience. It brings sound back to life like never before, with artful processing that optimizes audio content to deliver a richer world of detail and enjoyment for music, video, and gaming. 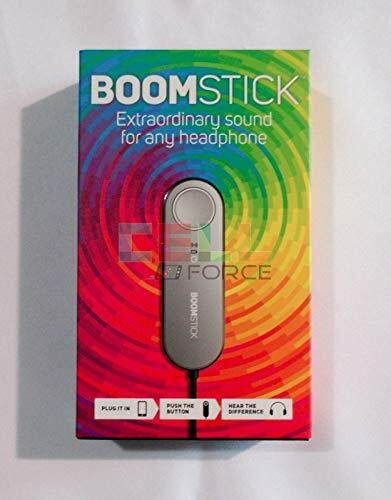 The Boomstick has two modes which control the experience while listening. Boom mode increases sound by 7 db, Boost mode increase sound by 11 db. The Boomstick does not have an independent volume control. Boom mode increases sound by 7 db, Boost mode increase sound by 11 db. The Boomstick does not have an independent volume control. 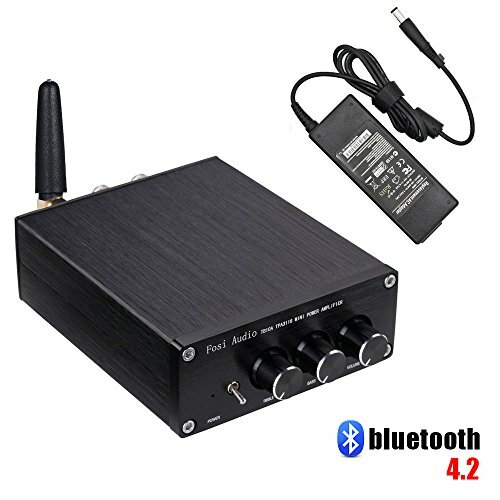 Wireless Bluetooth Connection Built-in 4.2 version bluetooth and the range up to 10 meters. Enjoy the wireless music streaming. NOTE: THE POWER ADAPTER IS NOT INCLUDED. Customizable Sound It features tone & direct switch which allows adjustment of how much bass & treble get through to be amplified. By switching to direct the filters are removed from circuit & the signal coming in is amplified w/o any filtering. High-Quality Audio DUTISON Latest 2 Dual Channel HiFi Audio Amplifier with 60 watt RMS at 4 ohm impedance and a frequency range between 10-40kHz for unrivaled sound superiority. It also features a blue LED illuminated volume knob which also serves as a power indicator. Mini But Powerful Don't be fooled by the size, it'll give your entertainment system a serious boost. Compatible to for ipad, cellphone, MP3 player, CD player, dataplay, computer, decoder, etc. Use it in your car, your boat, your RV, your golf cart, your home- anywhere you need a great amplifier with low distortion and acoustically accurate reproduction of music. Built-In Safety Features Equipped w/shortcut, overload & overheat protection to keep this amp & connected devices functioning properly & safely. The built-in loudspeaker protection circuit protects your speakers from high volume bursts of audio. 10. Supplied Accessories: Amplifier, Power supply, Manual. Known for producing sound as warm and vibrant as tube amplifiers, Tripath amplifiers have earned a solid reputation for sound quality from budget-minded audiophiles. The Kinter K2020A+ amplifier uses only original Tripath TA2020-020 amplifier IC's - not like the fake or "wannabe" IC's found in other similar looking amps. The K2020A+ is a rarity and the real deal. Original Tripath IC's are rare and difficult to come by - and that's why the K2020A+ is a "Limited Edition" amplifier. So, what makes the K2020A+ amplifier so special? First ,the technology inside. Tripath TA2020-020 chips are named as one of the "25 microchips that shook the world" by the IEEE - recognition that turns the head of any serious techie! Second, the proof is in the pudding, but in this case the pudding is the sound you hear (Note: no overselling, we acknowledge not all ears hear alike). The K2020A+ amplifier offers the audio fidelity of a Class-AB design combined with the power efficiency of Class-D amplifiers. 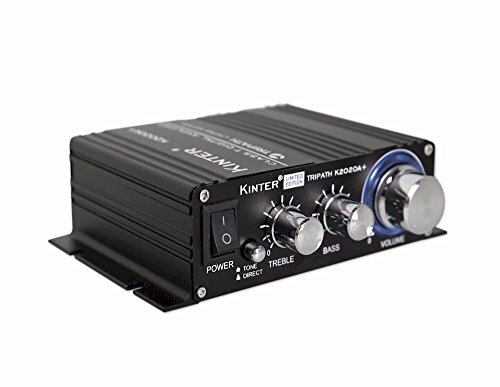 The K2020A+'s clean 20 watt output makes it perfect for almost any auto or home audio application or DIY project. Small enough to fit in your hand yet big enough to power your home speakers. To ensure long life and stable operation we include a 12 Volt 5 Amp power supply that provides plenty of "horsepower" to the amp. You might ask, what's with the extruded aluminum case? To keep the cost down we didn't put her in a pretty little dress, her beauty is inside - plus the case acts as a heat sink to keep the amp running cool. Features gold plated RCA inputs, or use the 3.5mm jack for plugging in sources such as iPods, smart phones, or MP3 players. Convenient spring terminals (16 gauge wire recommended) make speaker connections quick and easy! How can a modern Legend like the Mustang digital amplifiers be improved? simple-we do it again, bigger and better with the Mustang get 40. We take Seven decades worth of experience crafting inspirational tools and use it to add new (and better) amp and effects models while making it easier to use all of this without sacrificing one iota of power. We make it easy to control a studio worth of authentic amp and effects models with one finger via Bluetooth and the exclusive Fender tone app. We invent the worlds first Wi-Fi-equipped guitar amplifier, making it easy for you to download the latest updates, access Fender artist-created presets, and connect directly with a community of other creative players and music makers like yourself. We create the Mustang get 40 digital amplifier. 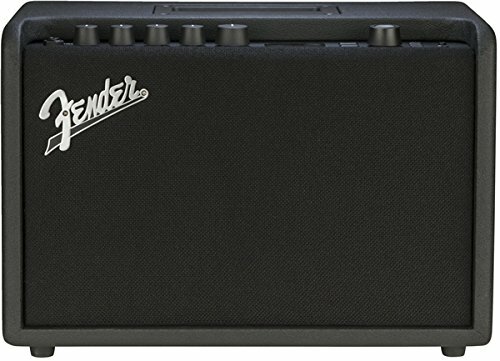 Brand: Fender | Manufacturer: Fender Musical Instruments Corp.
Onkyo again raises the bar for musicality in the entry class with its A-9150 integrated stereo amplifier. Unique technologies coalesce around a refined amplification system to deliver outstanding transient response, superb dynamics, lifelike sound staging, and nuanced articulation of your favorite analog or digital music. Key to this sense of realism is discrete Spectra module, which produces high instantaneous voltage as well as the AKM (Ak4452) 768 kHz/32-bit digital-to-analog converter. Akm (AK4452) 768 kHz/32-bit digital-to-analog converter brings CD's and digital sources to life. For vinyl, a dedicated mm/MC circuit board and high quality discrete head amp are present. 4 gold-plated analog RCA Audio inputs plus mm/MC phono input, 2 optical digital inputs, 2 coaxial digital inputs, 2 pairs of gold-plated speaker posts (a+b) to suite thick cables with banana plugs. Quimat have modified the TDA7492P audio receiver digital amplifier board that will be more convenient for users to operate the board.The key of the operation stability of the board are the input voltage and heating problems,so Quimat added the LED Display and heat sinks which will show the voltage and temperature while working and help the users to avoid the board burned by the high temperature. 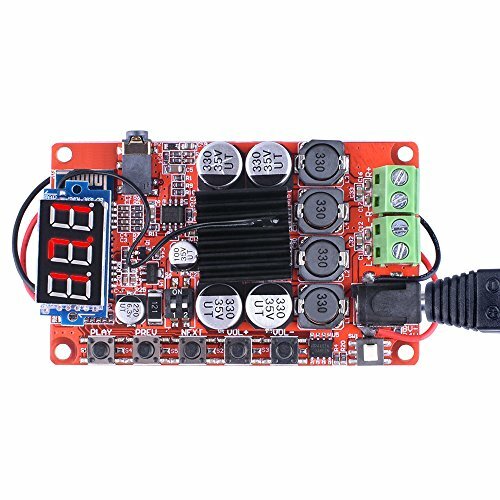 If you directly use Bluetooth,when power,wait 3s~10s,until LED Blue and Red light flashing alternately,then you can use your device to find my Bluetooth module,then connect it,can directly use it. Upgrated version,added the LED Display and Heat Sinks,which enhanced operation stability greatly of the audio receiver board. TDA 7492P digital amplifier chip,designed to optimize the circuit layout.Voice pure dynamic feels dye-in-the-wood. Bluetooth connection,remember your device,ready to open the door to the music world anytime. Thermal overload protection and short-circuit protection,fully protected against overvoltage,undervoltage,overcurrent and thermal overloads,etc. 100% Brand New and High Quality.High cost-performance. 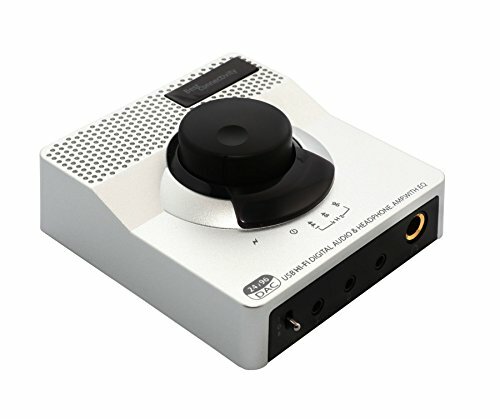 Ultimate HDMI karaoke mixer amplifier solution! 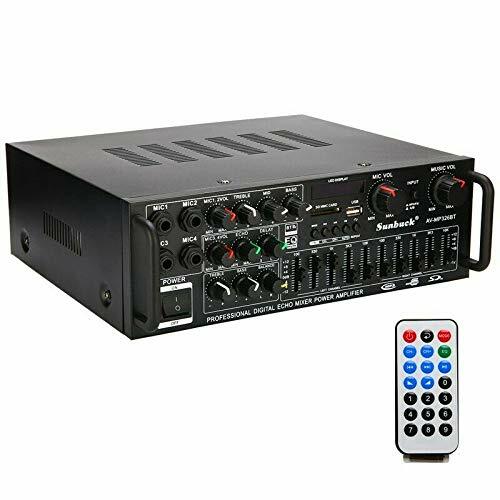  [Unique HDMI Karaoke Mixing Amplifier Solution] - Stream or play videos and musics freely, simply connecting this HDMI Mixer between RCA and HDMI sources for more impressive features such as connecting headphone to the front panel jack for a quiet listening. 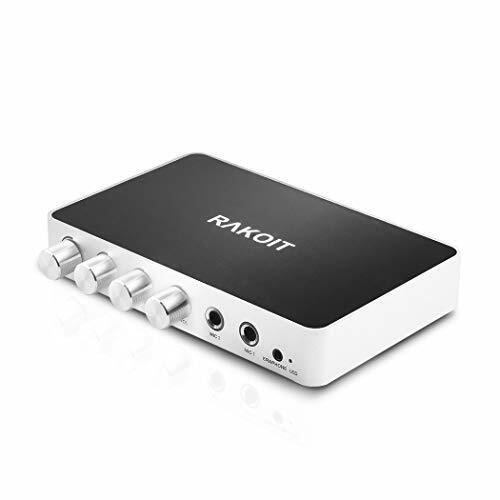  [Fantastic Audio-visual Enjoyment] - Rakoit karaoke mixer works fine with 4K/2K scaler and could convert 1080P or lower quality video to an advanced 4K/2K resolution ratio which brings you a total different audio-visual experience. 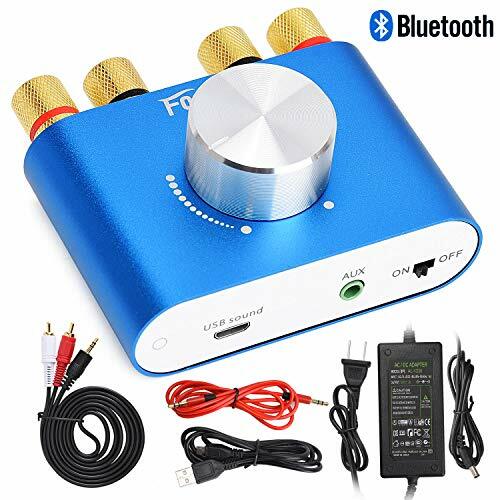  [Bonus Music Volume Adjustment] - Karaoke HDMI mixer support mix audio from 2 different microphones and allow to adjust music volume, echo, individual microphone volume, meanwhile, offer you a superior stereo audio quality.  [Intelligent & Moderative Controller] - To make the HDMI mixer works simultaneous with Android TV, Set Top Box, choosing computer to control the selection of songs or other operations, along with streaming or playing the videos or music.  [GET THIS Karaoke Machine RISK FREE] Since your satisfaction is our top priority, this karaoke mixer is backed by our 30-day money back guarantee policy! Unauthorized reselling of HDMI Karaoke Player is prohibited. Returns and exchange service is only for purchase from BOANJL TECH. 2.1-channel, personalized DIY active amplifier, more powerful and powerful bass to meet your picky hearing. 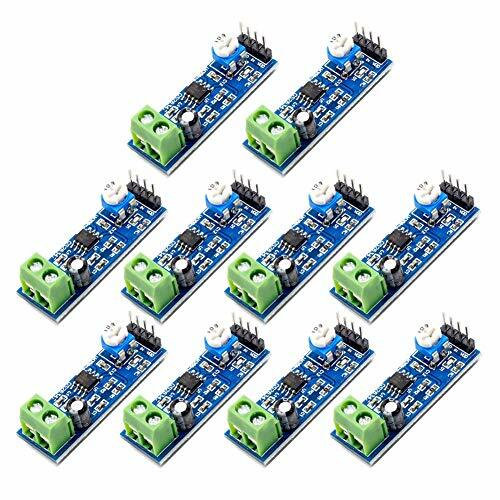 TPA3110D2-Q1 is a 15W (per channel) high efficiency. Class D audio power amplifier for driving bridged stereo speakers. High Quality Circuit Design The amplifier design technology from Yamaha is called ToP-ART which features an input to output with a direct symmetrical design. ToP-ART design and ART Base ensure optimum sound when processing and transmitting the audio signal. The signal is simple and direct, therefore it is less likely to be affected by noise and distortion. The left and right channels are organized in a straight, symmetrical layout for the highest signal purity. In addition, the ART (Anti-Resonance and Tough) Base bottom chassis and a solid center bar provide high rigidity support and dampers vibration. These design innovations contribute to this amplifier's rich audio reproduction with abundant musicality. Outstanding Audio Performance Notice the custom made power transformer, custom made block capacitors, two direct signal path speaker relays, one point grounding system, extruded aluminum heat sinks and other top quality parts to effortlessly handle demanding audio conditions. The quality of each individual part, as well as how they work together, basically determines the sound quality of this component. Yamaha uses only very high quality parts, carefully selected and tested for their sound properties. 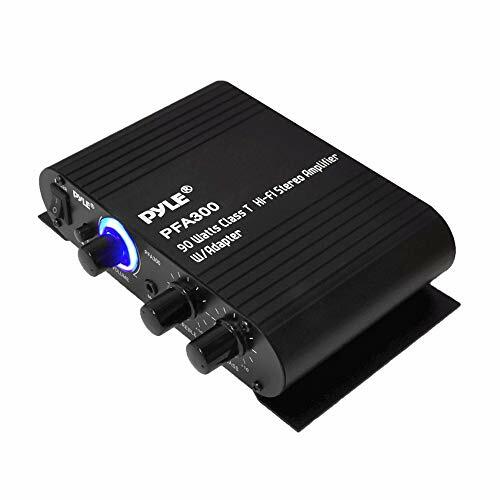 Pure Direct Mode for Greater Sound Purity The Pure Direct mode causes the audio signal to travel the shortest possible circuit route, bypassing the buffer amp, the tone, loudness and balance controls to virtually eliminate any signal degradation for the purest sound quality. Continuously Variable Loudness Control The A-S501 also features a new analog loudness control on the front panel that uses electronic volume for higher sound quality which lets you adjust the loudness effect as desired. Separate from the overall volume, this controls the balance of the low and high frequencies providing full tonal range at any volume level by compensating for the natural loss in the human ear at soft levels. MKP series:0.47uf(250V) 1uf 1.5uf 2.2uf 2.7UF 3.3uf 4.7uf 5.6uf 6.8uf 7.5uf 8uf 8.2uf 10uf 12uf 15uf 18uf 20uf 22UF(400v) 25uf(400v)27uf(400v) 30uf(250v) 33UF(250v) 40uf(250v) 47uf(250v) 50uf(250v)60uf(250v) 68uf(250v)75uf(250v)82uf(250V) 100uf(250v) 150uf(250v) 200uf(250v) Accuracy: 3% Each one has been tested and five packs. 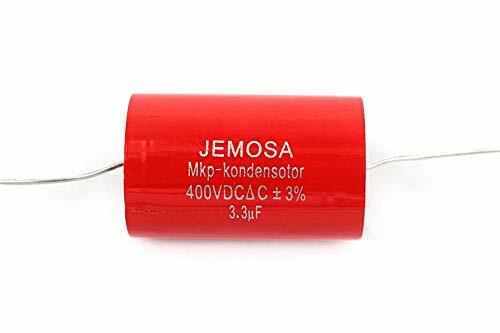 Features: This capacitor is a special audio capacitor, MKP series, high pressure resistance, small error, small loss angle, beautiful appearance. 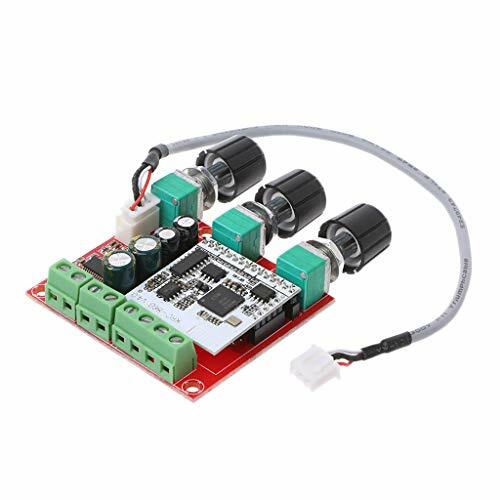 Commonly used in high-end audio, amplifier and crossover circuits If you need a lot, we can customize the capacitor according to your requirements. 4. Onboard power indicator, the main feet of the chip has been leaded, can input audio signal directly . Support 4 way microphone input. 2 tack output With EQ. Reverberation, fine tuning, balance, SD, USB interface. The USB Disk/Max 64GB SD Card is not included in the package. Please press the mode button to choose mode before being used. AUX/Line: Press until the word "AUX/Line" is displayed on the screen. FM: Press until the word "FM" is displayed on the screen. Bluetooth: Press until the word "BLUE" is displayed on the screen. 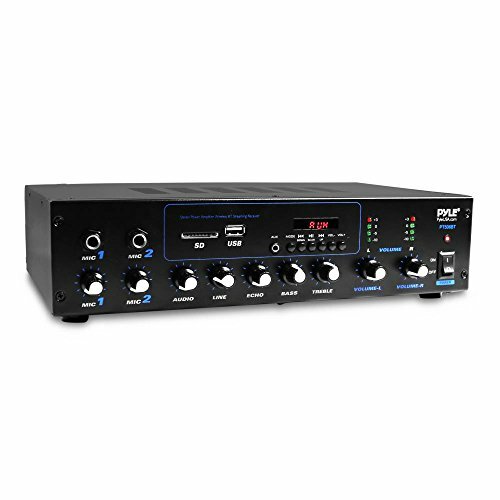 The dual channel stereo amplifier is perfect for your karaoke and home theater acoustic sound system. Gives you Max 400W +400W power and accommodates 2 sets of speakers for high quality amplified audio. 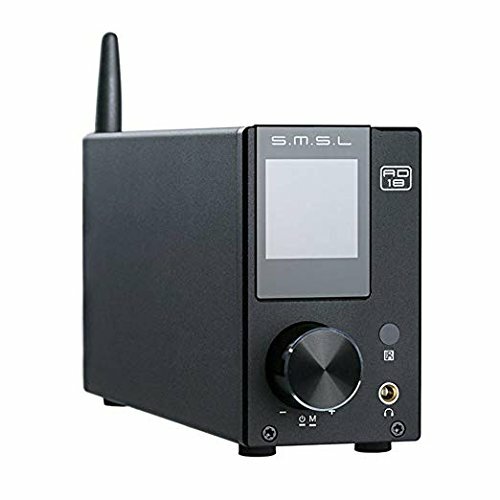 The personal portable digital amp box works with today's latest devices including smartphones, tablets, laptops and computers as it is equipped with Bluetooth wireless music streaming with hassle-free receiver pairing. The improved professional compact bookshelf sound amplifier features crisp, responsive buttons for mode controls. Rotary knob controls for mic echo / volume, balance, bass, treble, master volume, input source and the unique folder/track. 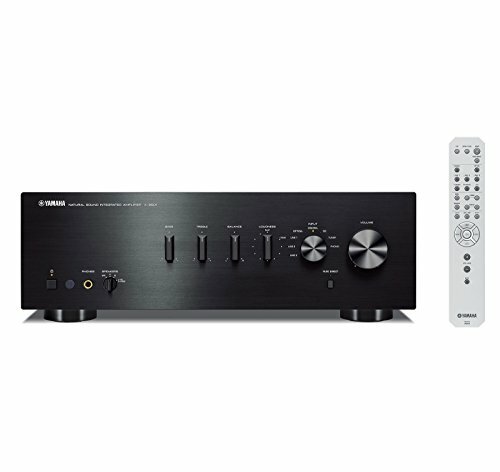 The integrated indoor stereo receiver supports reverberation, fine tuning, balance, SD, USB interface.Built-in digital LED screen showing track and folder name. A remote control is also included in the package for distant audio adjustments. Connect a pair of your favorite speakers to this stereo amp, then use your existing Wi-Fi network to access all of your music from a simple app. Add other Music Cast speakers, sound bars or receivers for wireless multiform audio playback. Great for use with in-ceiling and outdoor patio speakers.